The DJI Phantom 4 camera drone may be functional, but it’s not luxurious. 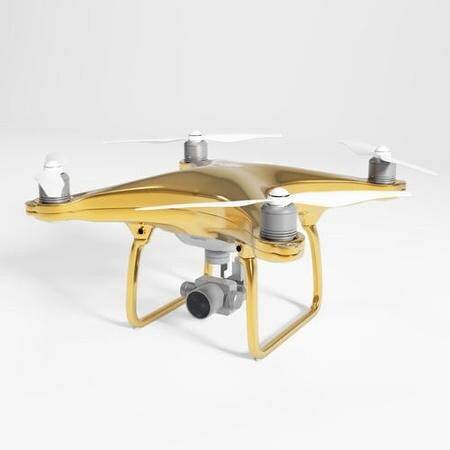 Filling that void is DronesDirect.co.uk, a drone retailer offering a 24-carat gold plated Phantom 4 model — something it has dubbed the ‘Rolls Royce of the drone world.’ The unit is the same as an ordinary Phantom 4 drone excluding the expensive gold coating. DronesDirect calls this the DJI Phantom 4: Gold Edition drone, and says it is an exclusive offering. Gold exterior aside, buyers get the same features as they would with any other Phantom 4 drone, as well as the remote controller, mobile device holder, an intelligent flight battery, a pair of propellers, propellers storage bag, battery charger, gimbal clamp and a 16GB microSD card. The Phantom 4: Gold Edition drone is available now for £19,999.97 / $21,800, with the company offering financing that brings it to £1,666.67/month for 12 months.